In cooperation with the Nebraska Sports Council and the Lincoln Convention & Visitors Bureau, the State Games of America will be held in the Lincoln and Omaha area. Under the State Games of America format, all residents of the host state are eligible to participate along with State Games participants from all other states who’ve earned a medal in the two years leading up to the State Games of America. Qualifying events include Summer Games held in 29 states and Winter Games held in nine states. 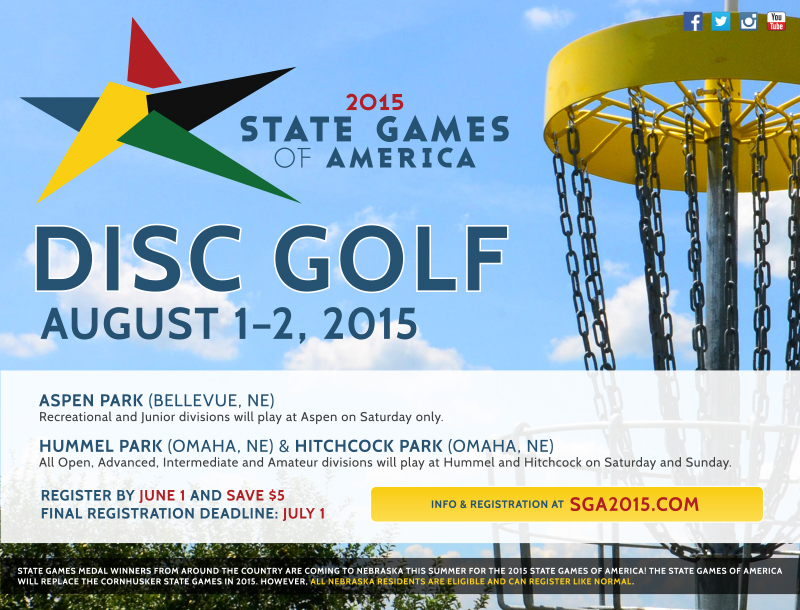 Disc golf competition will be held at two locations in the Omaha metro. Recreational and Juniors: All Rec and Junior divisions, except 9 & Under, will play 36 holes on Saturday only. Junior 9 & Under will play 18 holes Saturday only. Open, Advanced, Intermediate and Amateur: Two rounds of 18 on Saturday. There will be a round of 18 Sunday morning. There will be a final 9 holes for the top 4 finishers in the Advanced Men division. Temporary or alternate tees may be used at both courses. Register by June 1 and save $5. Final registration deadline is Wednesday, July 1. 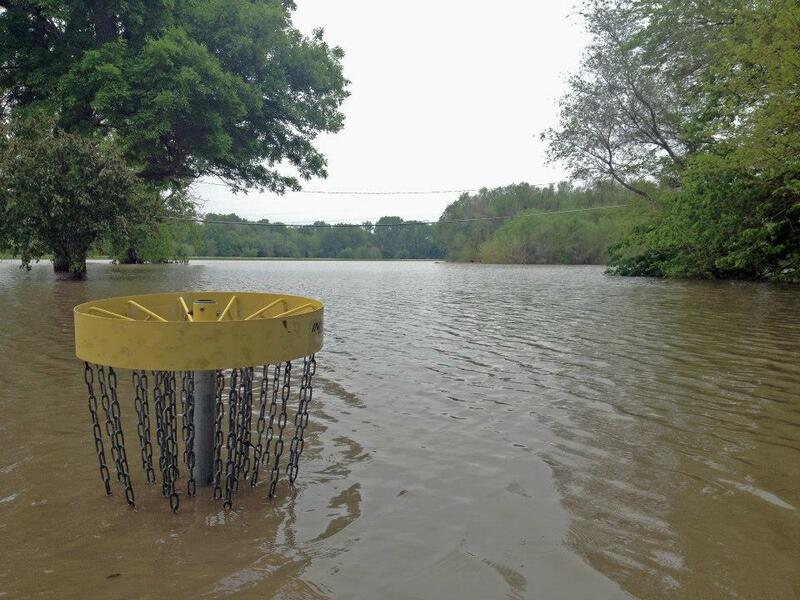 July 5 update: Registration will remain open until July 26 for disc golf. ALL NEBRASKA RESIDENTS ARE ELIGIBLE TO PARTICIPATE and can register like normal Cornhusker State Games years. Should space become limited, priority will be given to Nebraska residents who’ve medaled in 2013 and/or 2014. Additional criteria, in rank order include: participation in 2014 CSG and participation in 2013 CSG. 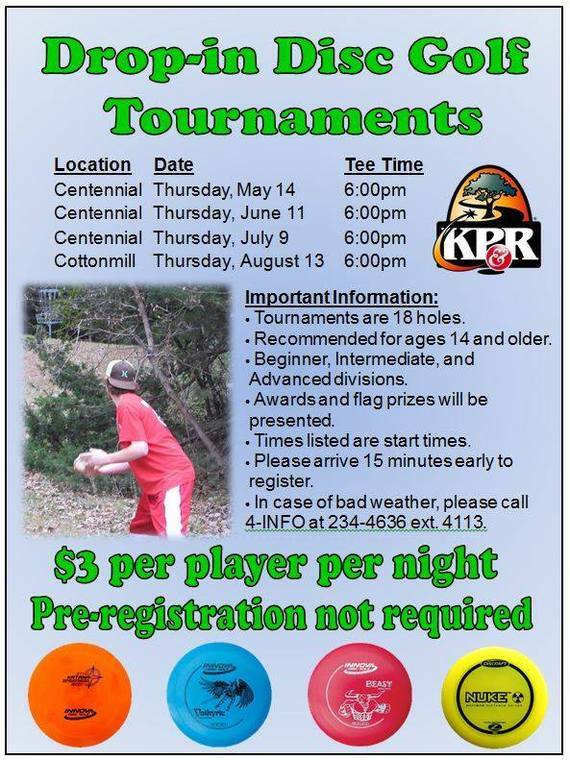 Hosted by the Kearney Parks and Recreation department, the Drop-in Disc Golf Tournaments meet once a month on Thursday evenings. May 14, June 11, and July 8 are at Centennial Park. August 13 is at Cottonmill Park. Tee time is 6:00pm. http://nebdiscforums.yuku.com/topic/4369 is a link to the discussion forum. 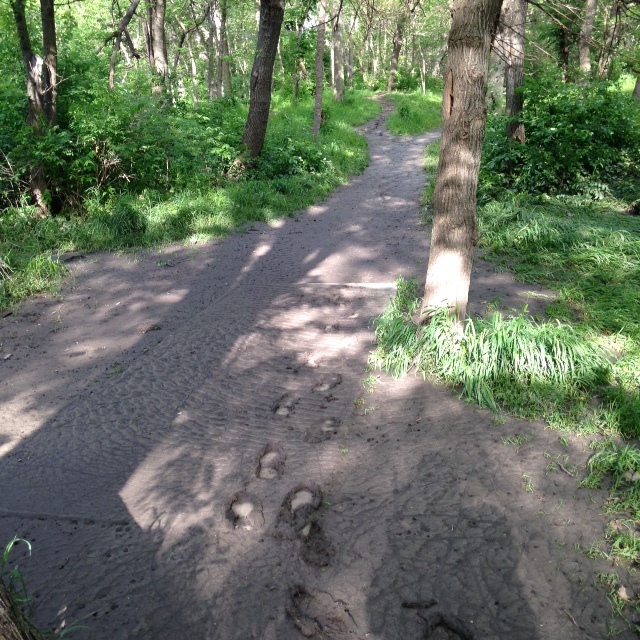 Ox Bow Trail in Ashland is closed due to flooding from Salt Creek. The yellow tops can be seen, the baskets are submerged. 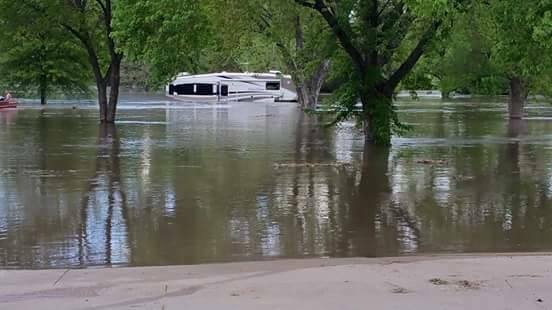 Chautauqua Park in Beatrice closed due to flooding from the Big Blue River. Roper Park in Lincoln is damp. Part of the course is closed for refortification of the Lynn Creek banks. Plum Creek Park in Seward was flooded and currently has areas of standing water. Any other course reports due to the recent rain? Feel free to comment. Where the bridge crosses the Missouri River from Nebraska to South Dakota in northeast Nebraska is Gavin’s Point. It’s also the location for the Saturday PDGA C tier tournament. When playing at Gavin’s Point it’s a nice view to look across the river to the high bluffs on the Nebraska side. 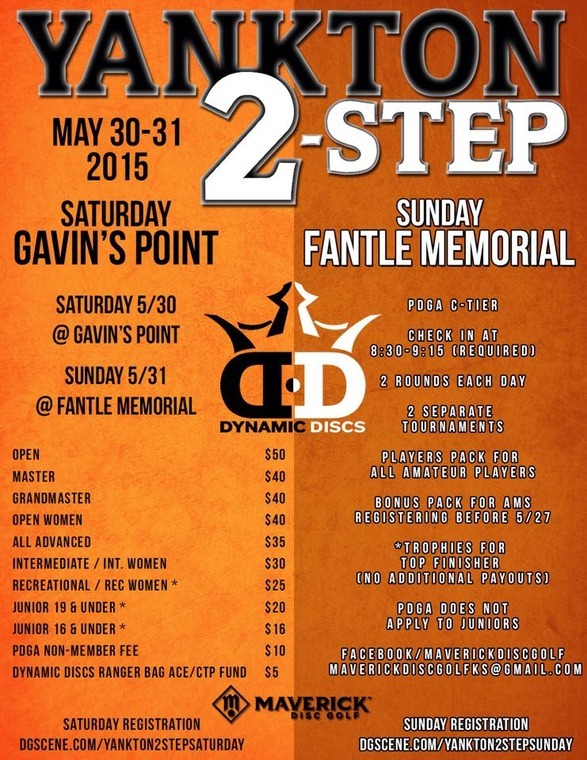 On Sunday is another C tier just up the road at Fantle Memorial Park.